I do test Huno's RTCW Reborn, and probabaly found the same issue as with Lugaru. Check from 0:50 , there i went to the roof and look at the sky. You can see that sometime, the effect which looks about the same as in Lugaru arise : same bounds of textures, sometime even empty ones..
What is interesting, in both cases and in Lugaru and in RCTW its "sky". Same effect on the wall on 0:20, then on 0:35, then on 0:42. Hmmm. Not sure that's the same. In Lugaru the faces on two sides are always missing, whereas in RCTW it looks more like a face culling algorithm is getting it wrong. Does it look the same as the lines we used to see in Quake 3? Any chance you can isolate the shader that's responsible? Does it look the same as the lines we used to see in Quake 3? Then yes, looks kind of the same. At least size of line for sure the same, but in q3 it was about lighting beems only, but there is on floor and on walls and dunno if light is guilty there (but can be of course). Oh.. Not sure how to do it. Gl4es for sure generate lots there, and how to know which one is related, and is it vertex or fragment one which is guilty, and if it shaders at all. For me most important to deal with Lugaru issue and that long-waiting bug about sampler-function-parametr, which is critical, as while ptitseb is still help , he start to loose interest to help to port one big title as without fixing that bug we cant continue :( is that one hard to fix in compare with others ? The quake-3 seams were caused by the fragment shader. The GPU has this thing called "whole quad mode" that needs to be disabled at certain points for texture-mapping to work correctly. I tried to fix that one yesterday, but it's going to take me a bit more time. Yes, it'll be in the next version. I haven't tested the performance change, though, so I'll be interested to hear what impact it has. At some parts yes, but on others you clearly see how the wrong texture is applied, or maybe the correct texture but falsely applied, or maybe one of the other quads is falsely positioned. It's really not that far away from the Lugaru symptoms at all, may well be (likely IMHO) the same issue or the same combination of issues. That issue with Lugaru and RTCW for sure can't be issue with wrong datafiles, as its the same datafiles which used on other platforms, and what more important, if i build minigl version of Lugaru which use exactly the same datafiles, everything fine. What is intersting to understand, is that its some general code issue anywhere, or it is some shader fails to work as expected.. Probably better (and more easy) will be to fix Lugaru's one, and then check if it will automatically fix RCTW , because RCTW is for sure harder to debug. Mmm, difficult to say if it can be the same issue. The effect is different, as the surface is always drawn, but sometime without a texture applied (or the wrong one). I don't think the quad is falsely applied here, because all faces seems to be rendered all the time. 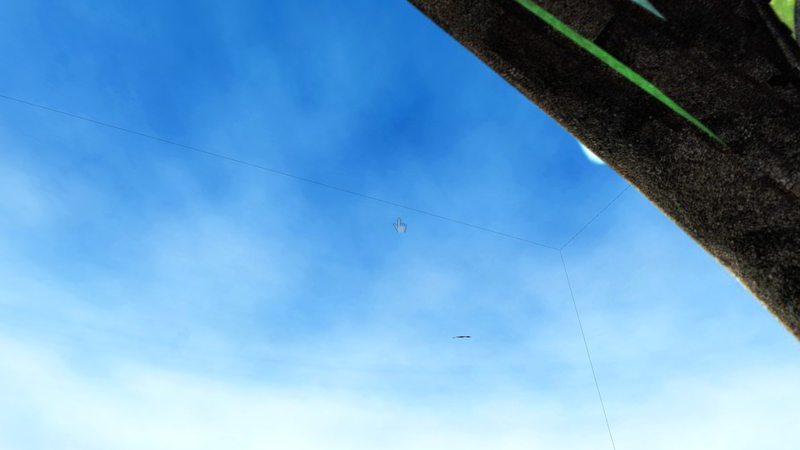 Seems it's only happening on the "sky cube map", so "distant" polygons. Is this a bug and can it be fixed? If it minigl, then its better go to minigl thread to avoid another sub-thread there (which will make harder to concetrate on gl4es and co). Yes, you said that earlier. Could you disable all rendering except for the skybox? Then maybe you can log the GL calls used to render just that item. Also, have you isolated the shader that's used for the skybox? I'm doubtful that it's a shader issue. The skybox's shaders should be pretty simple. ptiSeb also says it probabaly not shader, but some precision (loss) somewhere (because depending on the angle, the far edget of the poligon is "too far"), or the order of the draw command that makes a difference. In GLSL, the version tag is not mandatory, with #version 110 being the default. So at the very least the OpenGL driver maintainers on AmigaOS4 should be notified their implementation is not compliant with regard to this issue. Our ogles2.library contains a patcher for GLSL when the code doesn't contain a version tag. The internal (reference) GLSL-to-SPIR compiler would not compile texture2D and some other stuff in such a case. It is true that the standard says that if you leave out #version then it defaults to 1.10. However it is also true that the standard says: "... then it assumes 1.10, which is almost certainly not what you want." It is also true that the lack of a version tag is most often not because the coder wanted it, but simply because the coder forgot to put it there. That's why if the version-tag is missing, the library patches some typical function names. It's just a simple string replacer and the compiler is obviously not smart enough to cope with a variable that's named like a function ("texture" in your case). 1. fix your GLSL code by providing an explicit version-tag as I told you in the other thread. 2. disable ogles2's internal GLSL patcher by providing OGLES2_CCT_SHADER_COMPAT_PATCH, FALSE when creating your context. 3. wait for opengles2.library 2.3 , because for that one I just modified the patcher's behaviour: if the patched result fails to compile, then it will silently try again using the unpatched variant. I take the older Lugaru's sources (they a little bit smaller, while still have the same issue with gl4es while no issue with minigl), and strip it down heavy : i remove all the terrains, lighting, skeleton, person, objects, models, even sound, everything to make it smaller. In end i just have now when i run game : choice "start game", choise "tutorial", and then, just a pure sky rendering, and via mouse you can move camera , nothing else. Code compiles of course and for minigl (no bug) and for gl4es (bug there). So it mostly now GLDrawScene() (have lot of glcalls too) + a bit of game logic without gl calls + skybox's glcall. Any chance you can get us the vertex shader code? EDIT: Just looked at the Lugaru skybox code again, and I still don't see how a shader calculation bug could cause that. Each of the missing quads shares vertex coordiates with two of the visible quads. Yeah, will dump all shaders too, just tring to reduce it even more. Will try to reduce it even more now, and dump all the shaders. (today ptitSeb add another ENV variable to gl4es, which make it easy to dump shaders, without needs to hack the code all the time with prinfs). EDIT: and what is interesting, if checking carefull gl4es version video, then you can see that when we only run, some faces have copy of the previous screen (the same, as we have in RCTW Reboorn as well). I.e. chances are high that it the same issue. 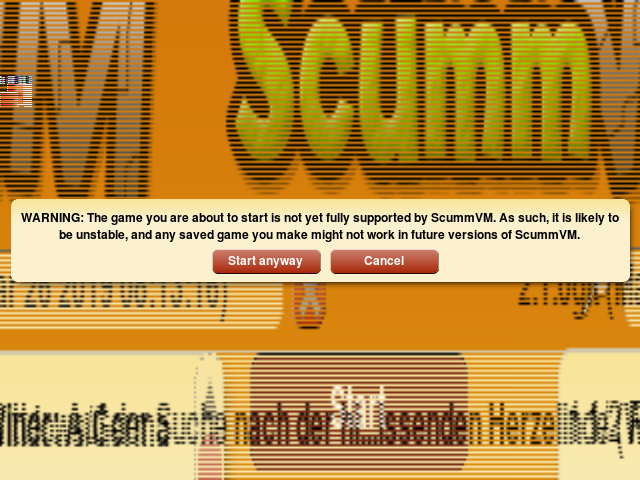 ScummVM compiled and started with ogles2. 2.1) If i click cancel in that box to return to the launcher/list screen, the mouse is now broken as well. Switching to fullscreen or back to window will "fix" the cursor. I think i know why the cursor in fullscreen is initially fine. It's because even if i start in fullscreen a window (filled black) is drawn first before it opens the screen.